In 2049, synthetic humans called replicants have been integrated into society on Earth, where they were once outlawed. Rogue older model replicants are still hunted and “retired” by law enforcement officials called blade runners. 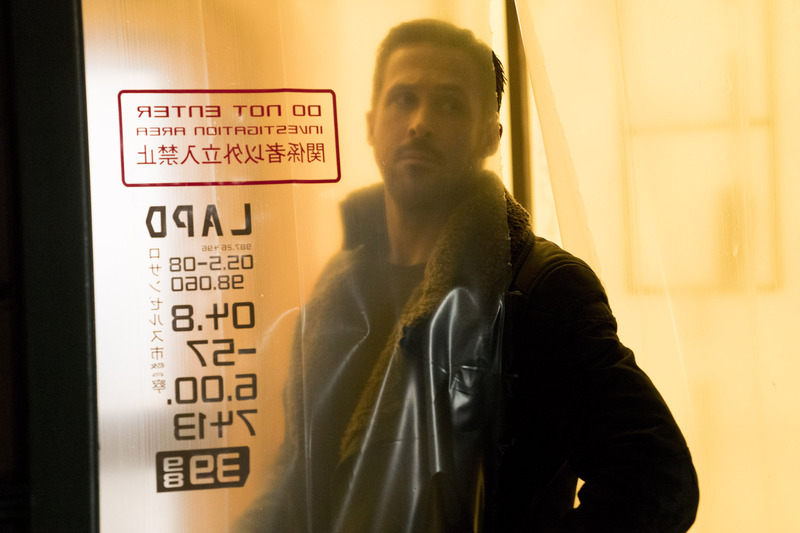 While on duty, one such blade runner named K (Ryan Gosling) uncovers a disturbing and potentially world-altering secret, which his superior Lt. Joshi (Robin Wright) wants to hush up. 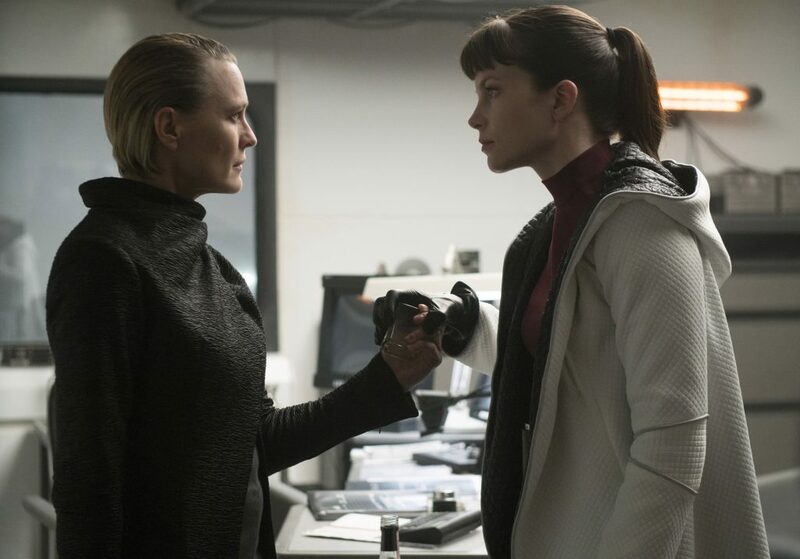 K’s investigation attracts the attention of Niander Wallace (Jared Leto), head of the replicant-manufacturing Wallace Corporation, and his replicant associate/enforcer Luv (Sylvia Hoeks), who begin to monitor him closely. 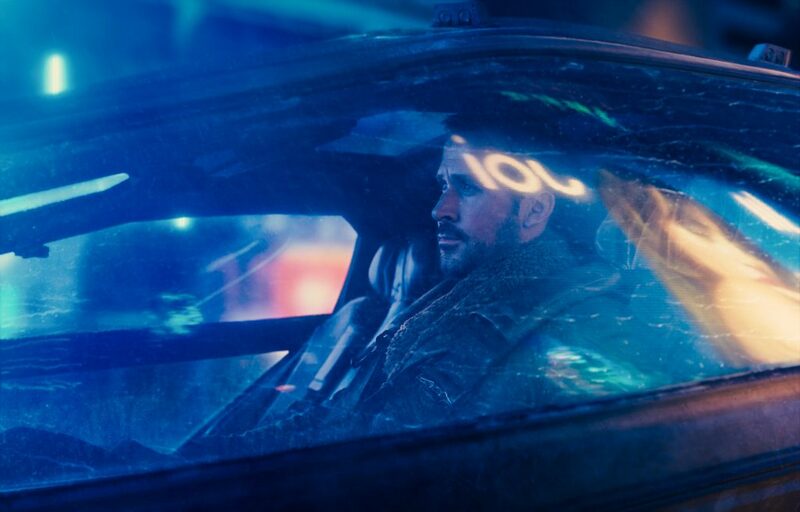 Questions mount as K – joined by his girlfriend Joi (Ana de Armas) – searches for answers, and he realizes that the key to everything lies in Rick Deckard (Harrison Ford), a former blade runner who has been missing for 30 years. The film wholly commits to fleshing out its depressing, gray world, resulting in an incredibly immersive experience. 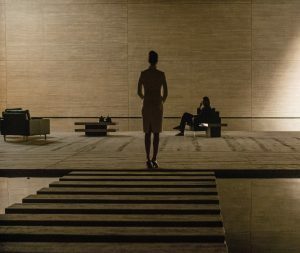 Villeneuve wants us to be keenly aware of what makes it dispassionate and empty, yet not without its moments of melancholy and beauty. He and editor Joe Walker adopt a methodical pace here, and it suits the exploration of this world. From the long establishing shots of locations like San Diego and Las Vegas to the minutes we spend in K’s apartment and in the streets of Los Angeles, these moments visually communicate so much about the characters, the nature of their relationships, and their environments. Throw in the fact that 30 years have passed since the events in the first film, and we also come to understand what kind of effect the integration of replicants into society has had on human-replicant relations as well as how replicants interact with each other. This is sci-fi world-building at its finest, rich with details that pull us further into the story. What’s quite striking about the film is how poignant it is despite its seemingly cold surface. This is a very character-driven picture, where their arcs, their emotional journeys, take precedence over and matter more than the plot. Villeneuve, along with screenwriters Hampton Fancher (who scripted Blade Runner all those years ago) and Michael Green, conveys so much about them through visual storytelling, by relying more on their actions, body language, relationships, and surroundings than their words. In addition, the filmmakers use the characters to not only continue exploring the original film’s question of what it means to be human, but also beautifully delve into themes of identity, self-worth, and what it means to have a soul. Empathizing with these characters, even those who are featured for only a handful of minutes, proves to be an effortless endeavor. The emotional stakes for them are gigantic, as their understanding of the world, each other, and themselves hinges on every answer they are about to receive. Such revelations tend to unfold haltingly (benefiting handsomely from the unhurried pace), imparting the crushing weight that is about to be unleashed. While the film does pick up Deckard’s story from where it was left off, K and Joi are undoubtedly the emotional hook here, and the most heartfelt scenes are the ones that revolve around the two of them. Though the characters turn out to be more memorable than the proceedings, the film operates from a well plotted story. There was a point where I thought I had the answers to the questions being raised, but the film led me on and shrewdly swept the carpet out from under my feet. Fancher and Green handle the plot’s twists and turns superbly, and they hide the clues that point to these revelations in plain sight. Still, there are parts of their script that don’t fly. 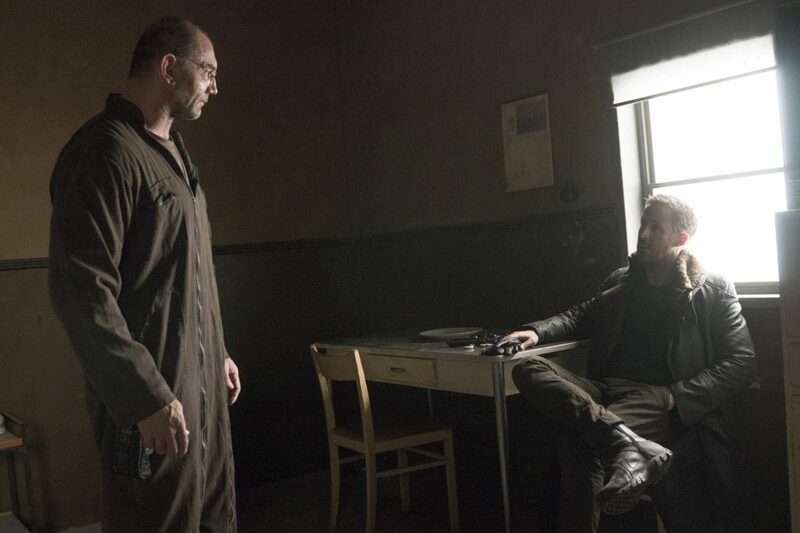 Wallace is a rather perfunctory villain, and his role in these affairs does get murky; at times, it feels like he’s here for the sake of having a bigger villain. This is partly due to the way the third act unfolds, as it just comes to pass without the grandiosity that I was expecting. Without giving anything away, it’s safe to say that the conclusion will leave many viewers flummoxed and in want of closure, though it isn’t too bothersome if you look at the film as a strictly character-driven piece, so in that regard, it ends perfectly. 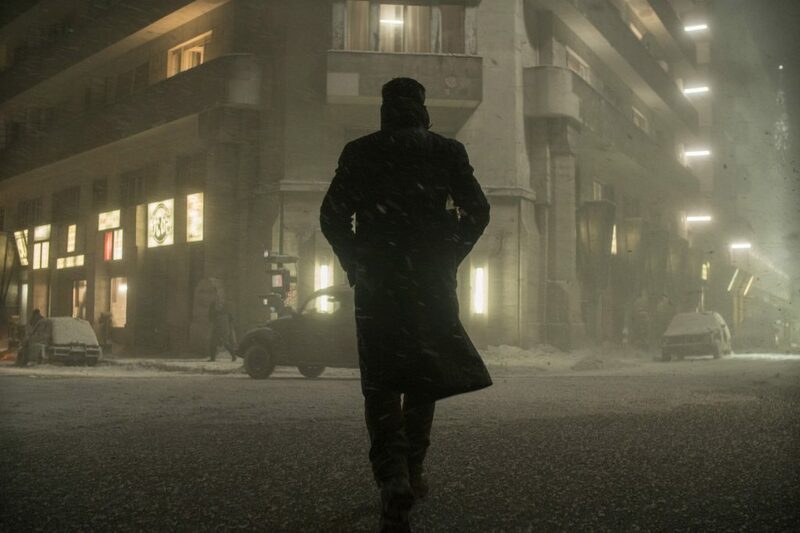 Being a continuation of Blade Runner is no easy task, but the film pulls it off and honors its predecessor’s legacy. You may ask whether you should watch the original film before watching this, and I say you should (the same goes for the three short films – 2036: Nexus Dawn, 2048: Nowhere to Run, and Black Out 2022 – which build up to the events being depicted here) so that the story can fully affect you. Whichever version of it you choose to watch doesn’t matter, though I personally recommend the 1992 Director’s Cut over the theatrical release and 2007’s The Final Cut. Bringing Deckard back into the fold could have been mere fan service, but thankfully, Fancher and Green are too smart for that. The character may not be the lead, but he has a key role to play in the proceedings and engages the themes in meaningful ways. What’s more, the filmmakers manage to preserve the original film’s long-standing mystery that has led to countless yet hearty disagreements among fans and even between Scott and Villeneuve. Villeneuve has assembled one hell of a cast, and no one puts a foot wrong. Gosling is simultaneously at the top of his game and understated. This may seem rather paradoxical, but you’ll understand once you witness how he oftentimes conveys K’s feelings and thoughts without having to say anything at all, instead letting his gaze and body language do the talking; it’s a testament to his intense screen presence and emotional maturity that we empathize immensely with his stoic character. There’s an innocence in de Armas’ performance that amplifies Joi’s hope and warmth, and she’s irresistible whenever she graces the screen. Hoeks and Wright excel at playing no-nonsense, badass women, and each of them further flesh out their characters with deadpan humor and poise respectively. Though featured in only a smattering of scenes, Leto chews scenery and succeeds at imparting the extent of Wallace’s narcissistic god complex. Ford definitely brings the gruffness that we know and love, but what makes him memorable here is the regret that hangs heavy in his voice and demeanor. Other highlights in the cast include Mackenzie Davis and Carla Juri, who greatly impress in their roles. The craftsmanship is simply out of this world, and words alone aren’t enough to describe what we see and hear. Blade Runner is a watershed in sci-fi design and visual effects, and it boasts a tremendous score by Vangelis. Its influence has not been lost on Villeneuve’s production team; they step up to the plate and hit home runs. Playing around with light, reflections, and the climate, the great cinematographer Roger Deakins conjures extraordinary images – particularly those featuring silhouettes – that are gorgeous and haunting. Dennis Gassner’s production design evokes the “used future” feel and cold Brutalist architecture that we saw in the original film’s vision of Los Angeles, but the opportunity to go beyond the city allows him to inject some melancholy and tragedy into this film’s depiction of San Diego and Las Vegas. Needless to say, this is a stunning film to look at, and much of that lies in how the practical and visual effects come together seamlessly. Renée April’s excellent costumes manage to stand out in this depressing world, even when they don’t bear much color. The clarity in the sound design and mixing makes every explosion, gunshot, hum, and tune distinct and sharp. While I was initially disappointed to hear that composer Jóhann Jóhannsson left the film, the soundtrack by Benjamin Wallfisch and Hans Zimmer is killer. The duo occasionally reference Vangelis’ work, but their sounds head in new directions, toward the ethereal and wistful, and perfectly complement the images. 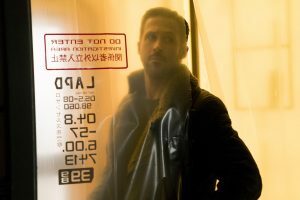 That Blade Runner 2049 proves to be a worthy sequel is cause for celebration; that it deftly builds upon the original film and becomes just as resonant and much more touching is nothing short of a miracle. 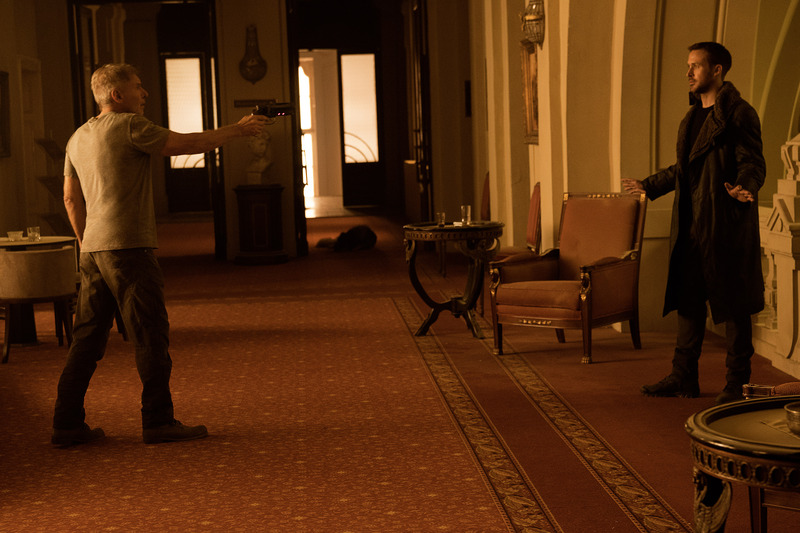 In being handed the keys to the Blade Runner world, Villeneuve has responded with a picture that others can only dream of making. I dare say that Scott himself could not have done any better. * Photos courtesy of Alcon Entertainment / Warner Bros.